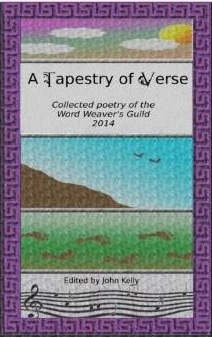 I am pleased to announce that the day is finally here: The word Weavers Guild has published our collected works, A Tapestry of Verse, available for purchase in paperback on amazon.com. (e-reader version should be available in a day or two) I am the third poet in the book under my real-world name, Ashley Sant. I have enjoyed putting this collection together, and I have come to greatly admire and appreciate my fellow poets. I hope you enjoy their creativity as much as I do.